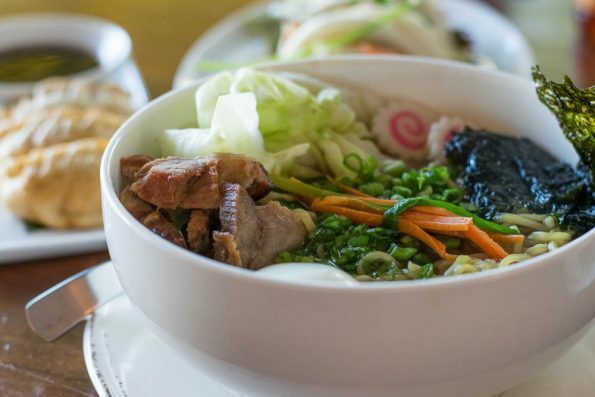 Ramen shops are popping up all over the Valley. The newest of these ramen houses is Water Chestnut! 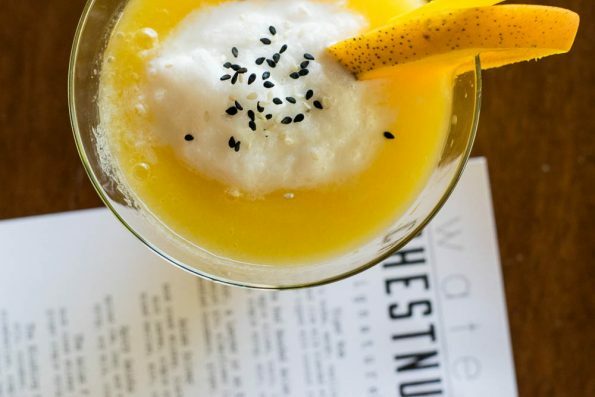 Water Chestnut is the new evening concept of Arcadia staple Chestnut. The contemporary cafe has been only open for breakfast and lunch up until this point. With this new concept, that will change (at least Thursday through Saturday). Featuring a menu chock full of delicious Asian fare and of course ramen from Chef Jared Lupin, Water Chestnut is sure to be a hit. We recently attended a preview dinner of Water Chestnut. Not only did we try their ramen, but also a few other small bites. Like always though, we started with cocktails! We ordered a Tiger Mom (Tito’s Vodka, mango, vanilla syrup, and rice milk blended with ice and coconut cream) and A Doctor, A Lawyer, or An Engineer (Botanist Gin, Elderflower Liqueur, muddled cucumber, ginger and basil). The Tiger mom was rich and decadent yet still light because of the mango. The Doctor (etc) was light and refreshing, it was reminiscent of a gin and tonic crossed with a Moscow mule. Both drinks were excellent and worth a visit on their own. 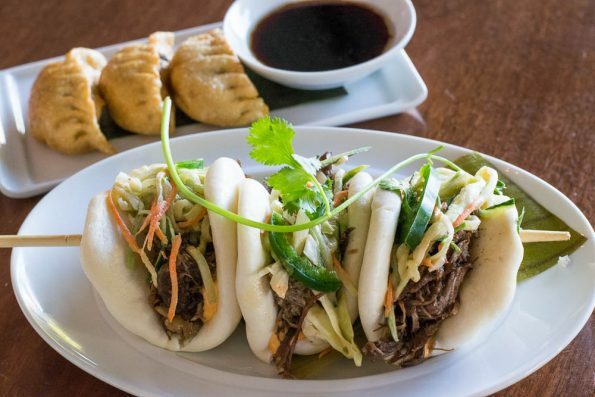 Before we dug into our ramen, we ordered an order of the Flash Fried Beef Potstickers and Roasted Duck Steam Buns. The potstickers were a fairly traditional version of a potsticker. However, the use of beef instead of chicken or pork really set them apart. The steam buns were incredible! We tend to love anything duck but these were knocked it out of the park! You could easily order these and eat them for a meal. The steam bun was the perfect texture and the flavors overall were just fantastic! Next was the moment we’d been waiting for, the ramen! We ordered 2 different variations. First was Pork Shoyu Broth with BBQ pork, house noodles, soft egg, steamed cabbage, nori, and naruto fish cake. Second was Garlic Pork Miso with roast duck, house noodles, and soft egg. Both ramens came with diced green onion, as well as a bundle of veggies. The broth in both of the ramen bowls was great! Perfect pork flavoring and just enough salt to know you were eating ramen. While all of the components in each bowl were absolutely on the nose, the unsung hero of the dish was really the noodles. It is so easy to over cook or under cook ramen noodles and that was not the case at Water Chestnut. These were spot on! At this point we were pretty full. Then we noticed it; the dessert menu! All of the dessert offerings sounded good, but we had to go with the mango sticky rice. For those of you who are unfamiliar, this is a traditionally Southeast Asian dish that features mangoes with a side of sticky rice that has been sweetened with coconut milk. This was the best way to wrap up our meal. The sticky rice was not too mushy and the combination of the mango and coconut milk with the rice was divine! We really enjoyed our meal at Water Chestnut! It really would make a fun date night on a Friday or Saturday evening! Though go early because with ramen as good as this, it will go quickly! Where are some of your favorite places to get ramen? We’d love to hear all about them! Leave a comment below or use the hashtag #GeekEats! Water Chestnut will be open Thursday, Friday and Saturday evenings from 5pm-sold out and it located at: 4350 E Camelback Rd. Bldg I-100, Phoenix, AZ, 85018.